will conclude with conclusions and recommendations. financial security and planning for the future. the intended results, it is necessary to evaluate it . ized Contentment Scale (GCS) . affected by HIV and AIDS. the other as the experi mental group. reliability coefficients that varied between 0.57 and 0.90.
an indication of the practical significance of differences. 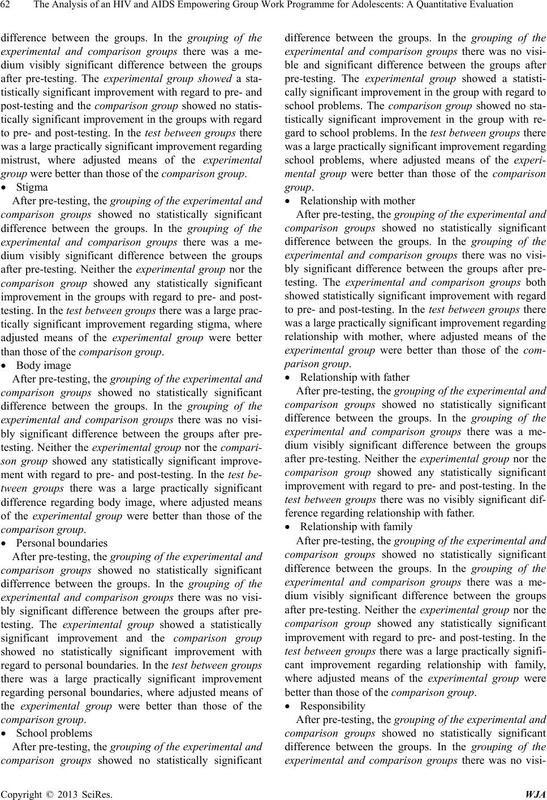 The results are expounded in Table 1.
programme, with the experimental group being better. mental group was exposed to the programme. Table 1. Results of pre- and post-testing of CFI-HIGH. the comparison group after post-testing. comparison group in the post-test. than those of the comparison group. were better than those of the comparison group. 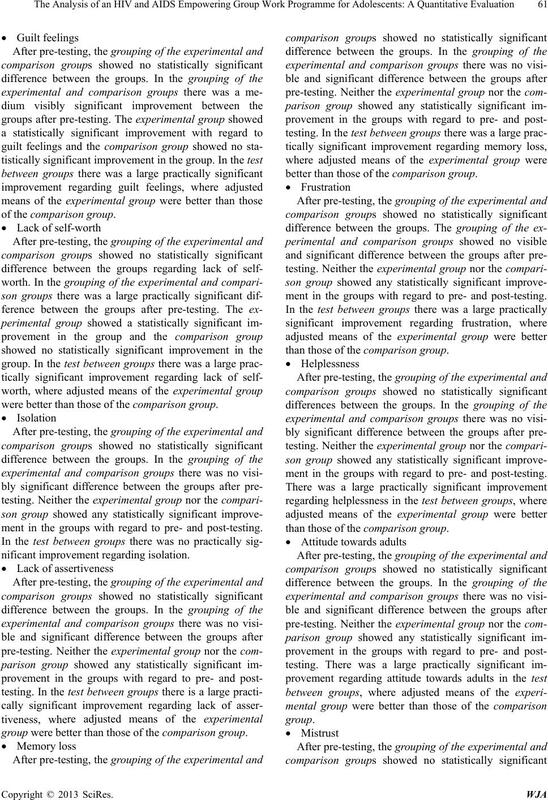 ment in the groups with regard to pre- and post-testing. group were better than those of the comparison group. better than those of the comparison group . ference regarding relationship with father. termine the respondents’ general contentment with life.  A score higher than 35 shows need for improvement.  A score below 25 is in the recommended range. lated with Cronbach Alpha coefficient and was 0.79.
indication of the practical significance of differences. 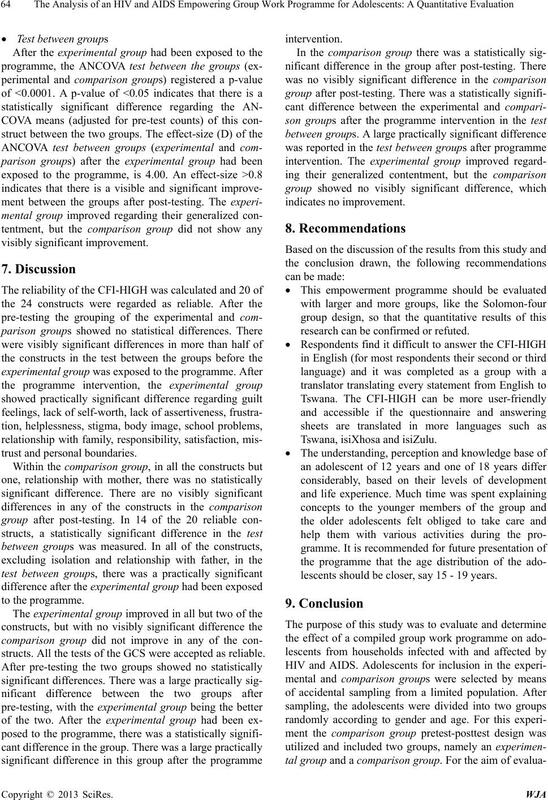 The results are expounded in Table 2.
experimental and comparison groups measured 0.20.
their exposure to the programme. in this group after the post-testing. Table 2. 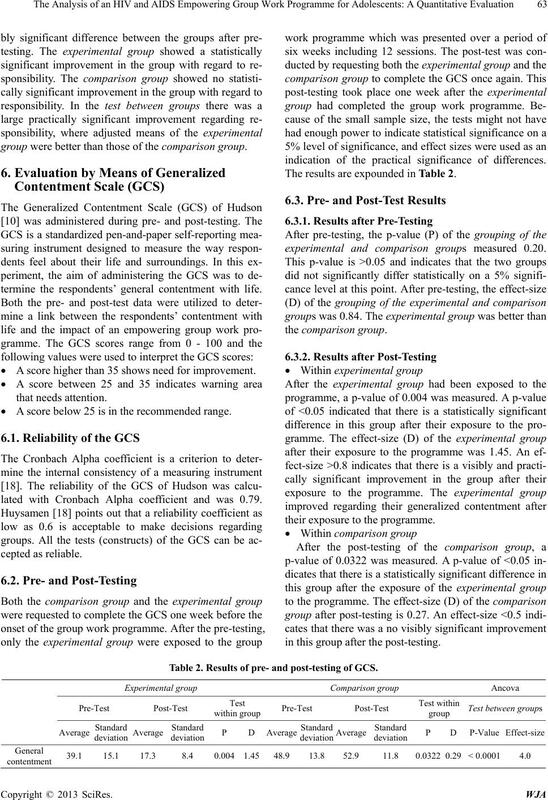 Results of pre- and post-testing of GCS. structs. All the tests of the GCS were accepted as reliable. research can be confirmed or refuted. lescents should be closer, say 15 - 19 years. and the GCS of Hudson. 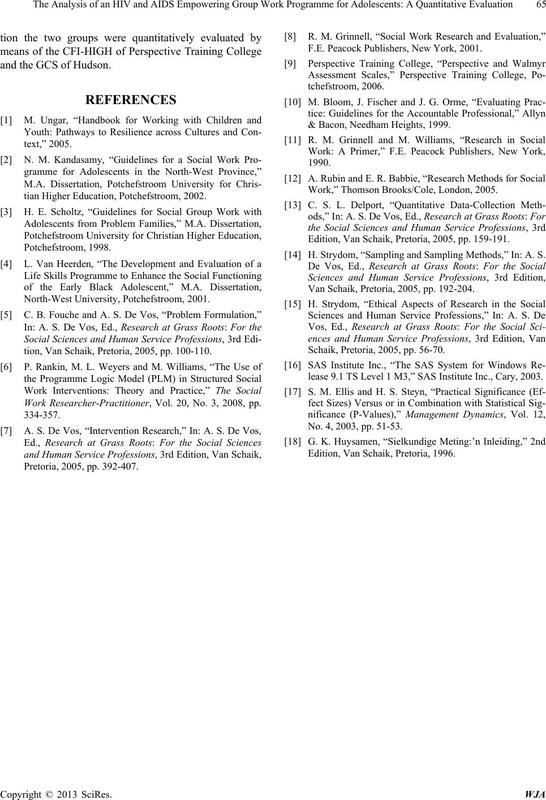 tian Higher Education, Potchefstroom, 2002.
tion, Van Schaik, Pretoria, 2005, pp. 100-110. 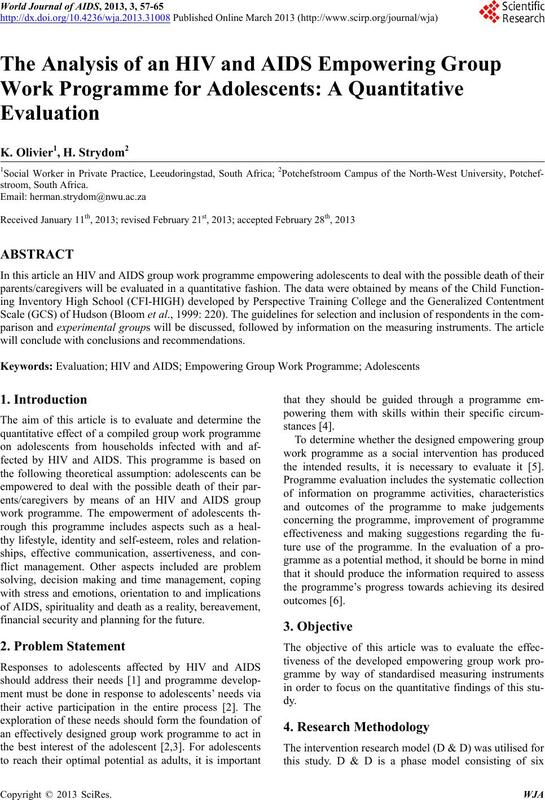 Work Researcher-Practitioner, Vol. 20, No. 3, 2008, pp. F.E. Peacock Publishers, New York, 2001. & Bacon, Needham Heights, 1999. Work,” Thomson Brooks/Cole, London, 2005. Edition, Van Schaik, Pretoria, 2005, pp. 159-191. H. Strydom, “Sampling and Sampling Methods,” In: A. S.
Van Schaik, Pretoria, 2005, pp. 192-204. Schaik, Pretoria, 2005, pp. 56-70.
lease 9.1 TS Level 1 M3,” SAS Institute Inc., Cary, 2003. No. 4, 2003, pp. 51-53. Edition, Van Schaik, Pretoria, 1996.